New, beautiful and the best hotel in Carbondale. From the moment you walk in the door you think - - now this is a beautiful Hampton Wow..... The Hampton Inn Carbondale is located at I-57, Exit State Rt. 13 east. 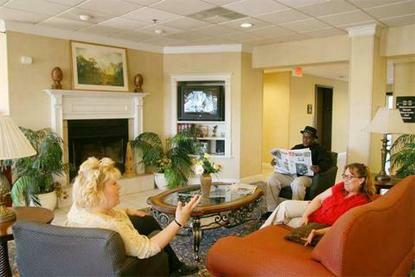 We are located 12 miles from exit right before you enter Carbondale.. We feature 80 rooms, some with whirlpool. We have an indoor pool with a whirlpool, sundeck, exercise room, and meeting space for up to 40 people. Amenities include complimentary continental breakfast, in-room coffee maker, hairdryers, voicemail, data ports, wireless internet, 25'' TV with three HBO channels, and pay pre view. Laundry/valet services, meeting/banquet facilities, and audio visual equipment are available for a nominal fee.